The Feiring Line / Wine Cop / Embrace the “Snobs.” Don’t Drink Cheap(ened) Wine. Embrace the “Snobs.” Don’t Drink Cheap(ened) Wine. “The Joys of Processed Wine and Ignore the Snobs, Drink the Cheap, Delicious Wine” was the two-titled opinion piece from writer Bianca Bosker. It appeared in last week’s New York Times. It didn’t strike a nerve but it did press buttons. “The story shouldn’t have been titled cheap wine, it should have been cheap shots,” wrote Vermont winemaker Deirdre Heekin. I’m not sure those who reacted to the click-bait of it all were being fair. Any thinking person who read Bosker’s conclusion (or the titles) would guess the writer was clearly out of her mind. But while I would have rather believed that explanation, I expect something else had to be going on. For me the Op-Ed’s problems were elsewhere; credibility and believability. Or as the Times magazine cover suggests, “Is truth dead?” In that Times piece was a deep bait-and-switch that you would only know if you read the Bosker book. Which I did. Photo grabbed from Marko Kovac‘s Facebook page. I’ve no idea where he found it. The Cork Dork—which reveals more about Bosker’s ambition and competitive nature than any love for or knowledge of wine—energetically chronicles her journey towards the first certified level of the Master Sommelier exam. This is more like running the Turkey Trot than the Boston Marathon, but through the study one should pick up some tips. However, being considered a pro or an expert does not come along with that first pin. I suppose this is why there are so many misleading and wrong statements in her essay such as “learning to savor the delicate aromas of aged Barolos from organic growers in Piedmont.” That’s a weird one? How old? This was one of the worst farmed areas for ages. Organic except for the very few is a rare thing. Farming practices do not separate the Grand from the Village, geology and micro-climate do. There’s a bunch of other stuff I can take on in the essay. While this might seem like small potatoes, it does makes me question her wine knowledge and grasp of the market. But what really confounded me was her flip from her book to a flop of a different conclusion in the Times. Here’s the deal: The Op-Ed was a condensed version of one of her book’s chapters entitled, Quality Control. In that chapter she discusses wine additives and the way marketing team can shape a wine. So in the Times she says processed wines are great. In her book when at the same big table tasting yeasted, chipped, mega-purpled, reverse-osmosed, acidified, enzymed, Velcorined wines, she seems to have had a very different experience. They reminded me of blueberry smoothies with a shot of vodka and Hershey’s syrup stirred in. But I was trying to keep an open mind. Price is a spice, I reminded myself, and don’t be such a snob. Truth be told, I didn’t want to finish them. There was nothing new that revealed itself after the second sip. 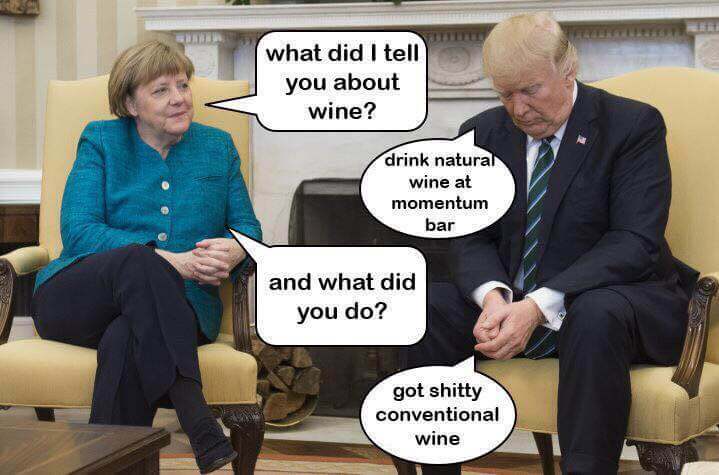 In the memoir she couldn’t drink the wines. In the essay she embraced them. Okay. Fess up. Which one is it? And what would prompt the author to so drastically change her opinion from book to post. In the age of press manipulation, the whole situation left me uncomfortable, and that the Times printed it, took her seriously was part of it. To most of us who take wine and food seriously, wines of pleasure are not concocted grape beverages from ground that I wouldn’t want to walk on let alone eat from. What gives pleasure is deliciousness from great winemakers who can work soils responsibly and give the grapevine an unadorned and unspoofed voice. If this piece that would land on April Fool’s Day I would have gotten it. But it didn’t. But frankly, any writer who confesses, as she has, to have a weakness for old champagne—which is a game only the well-heeled can play—comes off as someone sipping out of her coupe and saying let them drink cake, or rather Layer Cake.